Cystic fibrosis is a genetic disorder that is life threatening. A defective gene is passed from parent to child that causes the secretory glands (those that produce things like mucus, digestive juice, or sweat) to secrete fluids that are thicker than they should be. Instead of lubricating areas, secretions block important passageways, particularly in the lungs and pancreas. Although living with cystic fibrosis used to be nearly impossible, medical improvements have allowed those born with it to live decades longer than they used to. Here is a look at the symptoms, causes, diagnosis, and treatments of this difficult disease. Symptoms can be very different for each person, and an individual may experience different symptoms as the disease changes. Salty skin is one of the more noticeable signs. Cystic fibrosis can also greatly impair the respiratory and digestive systems. The respiratory system can become so clogged with mucus that makes it difficult to breathe, causing persistent mucousy coughing, wheezing, and difficulty breathing (especially during exercise). The nose can be constantly stopped up, nasal passages may inflame, and polyps, or small growths, may appear in the the nose. Because the excessive mucus allows bacteria to take hold more firmly, rather than being moved out of the system, frequent infections may result. The digestive enzymes of the pancreas can be prevented from reaching the small intestine, so that key nutrients are not absorbed when food digests. Children may not gain weight or grow normally. Low bone density can also be a problem, as it leads to osteoporosis or osteopenia. The fingers and toes may develop a clublike appearance (called clubbing), where they are very wide at the tip. Stool may be very oily or extremely foul smelling. Some people also suffer from frequent constipation, stomach pain, or excessive gas. Intestinal blockages occur, and are particularly dangerous for babies. Cystic fibrosis is a result of a mutated gene. According to the Cystic Fibrosis Foundation (CFF), there are more than 1800 different mutations. For the disease to develop, a child must receive a mutated cystic fibrosis gene from each parent. Just because two people have cystic fibrosis does not necessarily mean their child will have the disease. There is, however, a 25% chance. The chances of developing cystic fibrosis increase drastically if a family member has the disorder. While it does not discriminate among ethnicities, white Northern Europeans are at the highest risk. All United States’ newborns are screened for cystic fibrosis. Only the most common of the mutations are tested for, however, which means it is still important to pay attention to symptomatic markers. Blood tests check for high levels of immunoreactive trypsinogen, a chemical from the pancreas. Since a stressful birth can affect these levels in newborns, doctors may also collect sweat and test it for salt levels. Genetic tests can also be performed, to see if the person’s DNA contains the mutated gene. It can also figure out exactly which strain of cystic fibrosis the person has. Cystic fibrosis cannot be cured, but it can be managed on a symptomatic basis. Because every case is so different, there is no one particular prescribed method of treatment. Daily therapies may be performed. Clearing airways is essential to keep mucus loosened. Special vests can vibrate the chest to make it thinner, so it can be gotten rid of. Medications can be inhaled with a nebulizer (like that used for asthma) to loosen mucus and keep bacteria in check. Pancreatic enzyme supplements and multivitamins are often a must. The supplements help to break down and absorb nutrients so those with cystic fibrosis don’t miss out on vital nutrients. A group of drugs that targets the CFTR protein was discovered in 2012, and a new one was introduced just this year. 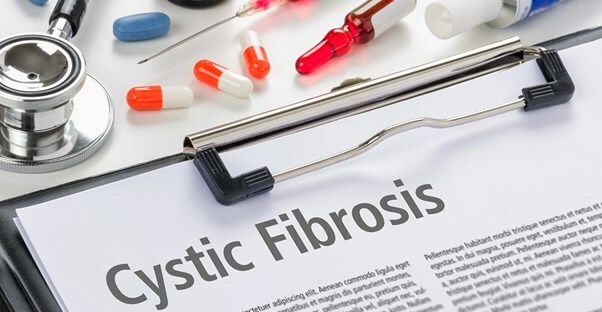 According to the CFF, these CFTR modifiers “treat the root cause of cystic fibrosis,” and have heralded an age of longer lives for those suffering from cystic fibrosis.